Abel Communications and the Colonial Athletic Association (CAA) will host a special networking event prior to the CAA Men’s Basketball Championship Game. The event returns to Baltimore this weekend March 6-9, 2015. 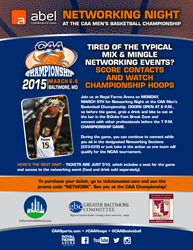 Networking Night at the CAA Championship will be held on Monday, March 9th from 6pm-7pm before the championship game. Event sponsors include The Greater Baltimore Committee (GBC), Downtown Partnership of Baltimore and BNI 4 Shore. Networking Night at the CAA Championship will take place in the Buffalo Wild Wings Fast Break Zone inside Royal Farms Arena. The networking starts at 6pm then continues throughout the game when all participants are seated together in the designated Networking Sections. Tickets are just $10, which includes access to the networking event and a seat at the game. For tickets, visit Ticketmaster.com and use the promo code NETWORK. The tournament begins Friday, March 6th at 6pm when local favorite Towson University battles Elon for a spot in the quarterfinals. First round games continue at 8:30pm with College of Charleston vs. Drexel and the quarterfinals begin at noon on Saturday. The semifinals begin on Sunday starting at 2:30pm and then the two remaining teams will compete for the championship on Monday night. The CAA includes reigning tournament champion University of Delaware, College of Charleston, Drexel University, Elon University, Hofstra University, James Madison University, University of North Carolina Wilmington, Northeastern University, Towson University and the College of William and Mary. For additional information on the CAA Men's Basketball Championship, visit the #CAAHoops Championship Central page. Facebook.com/CAASports – YouTube.com/CAASports – Instagram @CAASports – Twitter @CAABasketball – #CAAHoops & #CAABaltimore!